Sheffield Green Party have made a Clean Campaign Pledge for the forthcoming campaign and are inviting other parties in Sheffield to make the pledge as well. what others stand for and have achieved. – To refrain from personal attacks. – To make only honest and reasonable promises. – To take money only from organisations and individuals whose motives in giving us money we do not have reason to suspect. – To publish online details of all personal expenses incurred as a Member of Parliament. – To publish online details of all office expenses incurred as a Member of Parliament. – To publish online details of all donations of more than £1,000, in line with Electoral Commission rules. – To appoint independent inspectors to approve expenses accounts at the end of every financial year. – To open up the unedited expenses claims to local newspapers at the end of every financial year. – To meet all tax liabilities such as stamp duty without claiming them from the taxpayer. To sign on behalf of your party please contact Cllr Jillian Creasy Jillian.creasy@Sheffield.gov.uk / 0114 2727886. 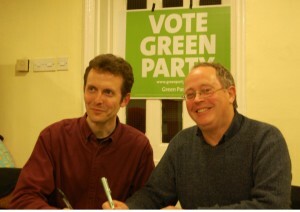 Sheffield Green Party – Signed by Jillian Creasy, Bernard Little and Rob Unwin on March 29th on behalf of all General Election and council election Sheffield candidates.